After over a year of development, blockchain platform NEM (New Economy Movement), and its cryptocurrency, XEM, officially launched on March 31st. NEM features a 100% original codebase, unprecedented Proof-of-Importance algorithm, low energy use, and a team of over 70 active people. Daegu, Korea, South, April 12, 2015	(Newswire.com) - NEM, is an original blockchain technology platform using a breakthrough innovation for blockchain consensus called Proof-of-Importance (POI). POI is a consensus mechanism that calculates an importance score for an account by taking into consideration its balance, activity of the account, as well as the importance of accounts transacted with. This importance score enables accounts to create blocks and “harvest” transaction fees based on the account’s importance to the NEM economy–not just those who simply have the largest amount of XEM. This encourages use of the currency and discourages hoarding, thus increasing the velocity of money. This helps alleviate many problems associated with Proof-of-Work mining, such as extreme price fluctuation on exchanges, deflation, massive power consumption, and centralization. With security being a main concern for blockchain platforms, NEM has taken steps to introduce new innovations to both secure the network and an individual’s account. One of these innovations is a peer reputation system using Eigentrust++, which helps protect the network. Eigentrust++ measures how well different computers on the network interact with each other and directs network traffic to the most trusted sources. NEM has also integrated an innovative time synchronization service between nodes and a new form of spam protection not seen in a cryptocurrency before. NEM incorporates a multitude of features to protect the user: blockchain-based multi-signature capabilities to maximize security while also maintaining ease of use, encrypted messaging, and a robust client-server web architecture that accommodates encapsulation of layers within the system. The NEM software consists of the NEM Infrastructure Server (NIS) and the NEM Community Client (NCC). 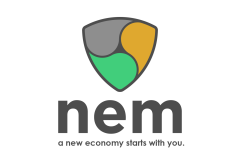 XEM, the cryptocurrency powered by NEM, is only an incidental part of the NEM ecosystem as NIS and NCC together form arguably one of the most advanced decentralized blockchain platforms in the world. Future releases will include smart property tiles, a decentralized asset exchange, smart contracts, and many more applications that utilize NEM’s core blockchain technology in innovative and revolutionary new ways to empower individuals–simple concepts, but with infinite expressibility. NEM’s architecture enables the use of “thin clients” that utilize NEM’s remote NIS feature. This feature allows for a broad range of devices and opens up access to NEM to a wider audience by allowing full NEM ecosystem functionality on extremely low-cost, low-power devices, like mobile phones, without any intermediary third parties required. This enables a user to have absolute control over using the NEM platform, without fear of a third party escrow taking control of their funds or assets. The release of NIS and NCC is only the first step towards launching the NEM ecosystem. The platform is designed with simple system integration in mind, which can enable features like high frequency exchange trading, real-world financial integration (e.g., stocks, derivatives, options, and forex), social media and social networking, enhanced and easy-to-use mobile applications, and many more advancements that can be easily integrated with NEM’s flexible and robust platform. Find out more about NEM at http://www.nem.io or the NEM blog http://blog.nem.io, where there are many tutorials for beginners. After over a year of development, blockchain platform NEM (New Economy Movement), and its cryptocurrency, XEM, officially launched on March 31st. NEM features a 100% original codebase, unprecedented Proof-of-Importance algorithm, and low energy use.